Optional: Add $25 for the collector's edition book Voyage of the Basset. Talk about tenure! This learned Fellowe is educator emeritus at the College of Magical Knowledge. He's so old, in fact, that he may not even know that the owl he pulls behind him is stuffed." 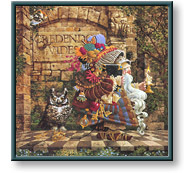 The Oldest Professor copyright © 1995 by James C. Christensen is prohibited from being copied.